Zach Eflin is an American professional Baseball player who plays in the Major League Baseball (MLB). As of 2019, Zach Eflin currently plays for the Philadelphia Phillies as their Pitcher. Previously, he played for San Diego Padres. As a Pitcher, Zach Eflin reportedly earns around $535 thousand as his yearly salary from Philadelphia Phillies. 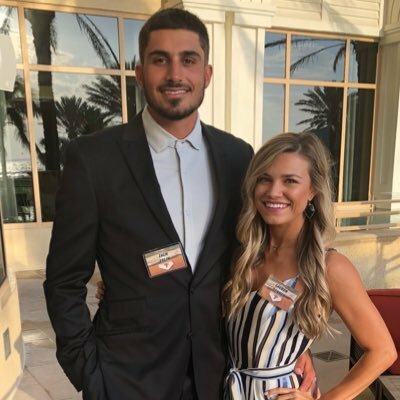 Further, Zach Eflin has an estimated net worth of over $1 million. He is currently dating his girlfriend Lauren Dennen. Zach Eflin was born on April 8, 1994, in Orlando, Florida to parents Larry and Catherine. As per his nationality, he is American and belongs to White ethnic group. Further, his star sign is Aries. He grew up along with his 3 sisters. Eflin attended Paul J. Hagerty High School in Oviedo, Florida. Eflin had a 0.51 earned run average( ERA) in his senior year and a total of 59 strikeouts in 43 innings. As of 2019, Zach Eflin has an estimated net worth of over $1 million. Further, the MLB player has an average salary of $535 thousand annually while Jake Arrieta is one of the highest earners of the team with an annual salary of $25,000,000. Additionally, Zach Eflin so far has made earnings of $2,431,622 from his entire MLB career. Furthermore, he is one of the players who receive a salary as a pre-arbitration player with reference to his service time in MLB. "In particular, MLB uses the salary arbitration system known as the last arbitration offer. Players are subdivided into three categories under the current MLB- MLBPA collective bargaining agreement:( 1) pre-arbitration players;( 2) wage arbitration players; and( 3) free agents. Furthermore, he also makes a considerable amount of money from endorsements, which certainly helped him to collect a satisfactory net value. Unlike his professional career, he hasn't revealed much about his personal life. The famous MLB star is dating his girlfriend Lauren Dennen as per various sources. He also mentioned about having a girlfriend after signing his contract with the Phillies. One of Eflin's three sisters lost her life battling with leukemia. Talking about his body measurement, the Famous MLB star is 6 feet 4 inches in height and weighs around 98 kg. After his high school career, the San Diego Padres selected Eflin in the first round of the 2012 Major League Baseball draft with the 33rd overall selection. In exchange for Tim Federowicz, Matt Kemp and cash, the Padres traded Eflin, Joe Wieland, and Yasmani Grandal to the Los Angeles Dodgers on 18 December 2014. The Dodgers then traded Eflin for Jimmy Rollins together with Tom Windle to the Philadelphia Phillies. Eflin debuted in Major League league on 14 June 2016 at the age of 22. In 2016 he was 3–5 with a 5.54 ERA and 31 strikeouts in 63.1 innings with the Phillies. On April 18, he was recalled by the Phillies to replace Clay Buchholz in the rotation after recovering from knee injury.